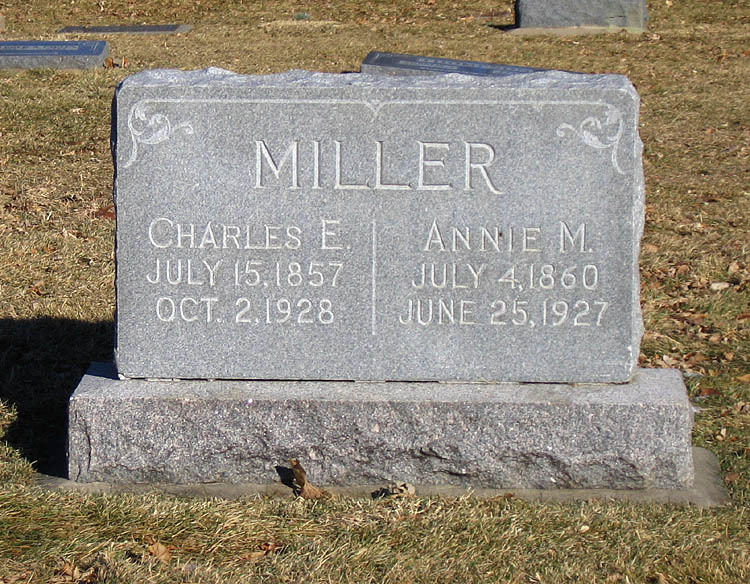 Annie Miller died 25 June 1927 in Denver, Colorado, while visiting her daughter Esther Miller Breisch. Charles was at their home in Missoula, Montana when she died. He died the following year, 2 October 1928, in Missoula, and was buried with Annie in the Crown Hill Cemetery. Charles and Annie are buried in the Crown Hill Cemetery in Wheat Ridge, Colorado, at the western edge of Denver. Their gravesite is in Section 8, Lot 253, Block 22. The correct year of birth for Charles is 1856, not 1857. Photographs thanks to Frank Paige, Rootsweb Message Board, December 2008, who was kind enough to take five photos of the gravesite. Used with permission.